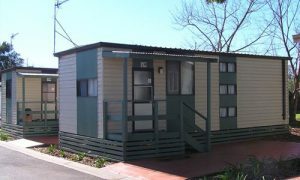 Our well appointed one bedroom cabins are fully air conditioned and feature an eleven metre deck with privacy screen. There is a 5 piece outdoor setting. 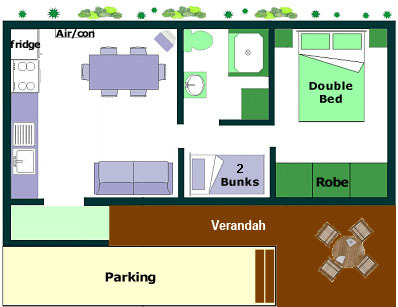 Internally there is a very comfortable living area, separate main bedroom plus double bunks off the en-suite. * Peak periods includes Australia Day, Easter, Anzac Day, the June long weekend, the October long weekend, Christmas / New Year period and school holidays. Conditions: Minimum bookings may apply.Rates are subject to change without notice please check when booking. Your Credit Card details must be provided to secure your reservation & for security against park amenities, site power and cabin accommodation.